Yosemite National Park, not just a great Valley, but a shrine to human foresight, strength of granite, power of glaciers, the persistence of life, and the tranquillity of the High Sierra. The Yosemite Valley is known for its breath-taking sheer walls and valley floor. The Valley's evolution began when alpine glaciers permeated through the canyon of the Merced River. Ice carved through the granite leaving such intriguing rock formations as El Capitan and Cathedral Rocks. The Valley is home to a variety of wildlife and the most majestic waterfalls of the world. The beauty of Yosemite is unsurpassed and is a favourite of nature lovers and photographers. Yosemite Valley is a half-mile deep depression carved by glaciers during the last ice age, which now has soaring 3,000 foot high granite domes and many awesome waterfalls, including the third and seventh highest in the world. The area received National Park status in 1880, as a result of the efforts of the pioneering Scottish naturalist John Muir, and has grown in popularity ever since. 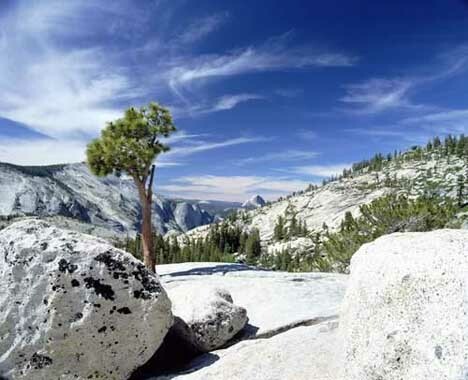 In summer, you can drive from the valley floor to the 3,200-foot high Glacier Point, which offers the park's most stunning panoramic vistas, including views of the High Sierra to the north and west that are beyond breath-taking.